This shortline operator was been on a bumpy road until recently when they went out of business. The turnbridge they operate between the Island and the mainland was taken out of commission by the FRA, and their engine is not up to standards and prohibited from operation until it coule be fixed. Serving a single customer on Tonawanda Island and interchanging with Conrail, operations had ceased until they can bring the bridge and locomotive upto federal standards. Because of the prohibitively high costs of doing so for a small amount of traffic, the railroad closed shop. Joe VonHedemann wrote in with an update on the TIRL: "Just an FYI, I was in the Tonawanda area on 6/10/98 and the spur to Conrail's Niagara branch was being pulled up. The rails were gone and the ties were in a large pile. So the TIRR is dead." The Federal Railroad Administration (FRA) of the United States Department of Transportation (DOT) has determined that public safety compels issuance of this Emergency Order requiring the Tonawanda Island Railroad (TIRL) of North Tonawanda, New York, to discontinue operation of trains or any railroad on-track equipment on a railroad bridge numbered 7708810 which spans the Little River between North Tonawanda and Tonawanda Island, New York, until necessary repairs have been made to the bridge. The Tonawanda Island Railroad (TIRL), a common carrier, is a part of the general system of railroads. Its owner is Mr. Corigan Sanoian, P.E., of Niagara Falls, New York. The TIRL operates over about a 1.5 miles of track, extending from a junction with the Conrail Niagara Branch in North Tonawanda, New York, to Tonawanda Island. The single main track route includes two highway rail grade crossings. One crossing, at River Road in North Tonawanda, is equipped with automated warning devices. The other highway rail grade crossing is located at Main Street in North Tonawanda and is equipped with traffic control signals on each side of the crossing. In addition to the main track, several auxiliary tracks are in service, both at the junction and on Tonawanda Island. To access Tonawanda Island, the TIRL crosses the Little River via a wood and metal bridge identified by a number affixed to its westernmost bent, 7708810. For the purposes of this Emergency Order, the bridge is hereinafter designated as ``Bridge 7708810.'' The bridge consists of two timber trestle approaches, one on each side of a steel through truss swing span. The swing span has been inoperative for many years. The Little River is a navigable waterway formed by a channel of the Niagara River, Ellicott Creek and Tonawanda Creek. It flows into the Niagara River approximately 10 miles above Niagara Falls. The Little River is the site of a significant concentration of pleasure boating during the summer. A marina is located adjacent to and downstream from the bridge. A highway bridge is located about 300 feet downstream. The sole piece of rolling stock regularly used by the TIRL is a 50- ton industrial switcher type locomotive. The railroad's current customer base includes a consignee on Tonawanda Island which receives wood fibre in box cars. There are no consignors. Until approximately one year ago, the TIRL delivered building materials to another consignee on Tonawanda Island. However, that consignee discontinued service from the TIRL after Mr. Sanoian expressed an intent to shut down the railroad. Total traffic for TIRL in 1995 was about 51 cars. October 11, 1990: FRA Chief Inspector John Conklin conducted an operating practices inspection and issued inspection report No. 72, informing Mr. Sanoian that the TIRL was not in compliance with 49 CFR Part 225 (Accident/Incident Reporting), as well as 49 CFR Part 228 (Hours of Service Recordkeeping). December 17, 1990: FRA Railroad Safety Inspector Daniel Feneziani inspected the TIRL locomotive and issued inspection report No. 171, informing Mr. Sanoian of 17 items not in compliance with the Federal railroad safety standards. February 28, 1991: Chief Inspector Conklin conducted an operating practices inspection and issued inspection report No. 30, informing Mr. Sanoian that the TIRL still was not in compliance with 49 CFR Part 225. December 10, 1992: Chief Inspector Conklin conducted an inspection of operating practices and issued inspection report No. 50, informing Mr. Sanoian that the TIRL was not in compliance with 49 CFR Parts 225, 228 and 240 (Qualification and Certification of Locomotive Engineers). October 21, 1993: FRA Chief Inspectors Patrick Sullivan and William Robbins inspected the TIRL locomotive and issued inspection report No. 05, informing Mr. Sanoian of 22 items not in compliance with Federal railroad safety standards. December 7, 1994: Chief Inspector Sullivan conducted an inspection of operating practices and issued inspection report No. 27, informing Mr. Sanoian that the TIRL was not in compliance with 49 CFR Parts 217 (Railroad Operating Rules), 225, 228, and 240. August 9, 1995: FRA Principal Railroad Safety Inspector Bernard T. Lutz inspected the TIRL locomotive and issued inspection report No. 67, notifying Mr. Sanoian of 15 items of non-compliance with Federal railroad safety standards. January 2 and January 4, 1996: FRA Railroad Safety Inspector Ronald Anderson inspected bridge 7708810. His inspection was in response to concerns raised by a New York State Department of Transportation Railroad Safety Inspector. Inspector Anderson concluded that the bridge is unsafe. While inspecting the bridge on January 2, 1996, Inspector Anderson fell through the bridge due to the deteriorated condition of the bridge timbers. January 12, 1996: Inspector Anderson and New York State Department of Transportation Inspector Keith McClain met with Mr. Sanoian to discuss the condition of the bridge. Mr. Sanoian disagreed with Inspector Anderson's assessment of the bridge and stated his belief that the bridge was safe for a load of 500,000 pounds. January 15, 1996: Regional Administrator McKeon and Railroad Safety Inspector Michael Ziolkowski met with Mr. Sanoian to discuss both the locomotive and the bridge. Although he did not agree that the bridge was unsafe, Mr. Sanoian stated that he would not operate over it until it had been repaired and had been inspected by an FRA representative. He further stated that the locomotive would not be used until it was repaired. Regional Administrator McKeon hand-delivered to Mr. Sanoian a copy of the letter of October 13, 1995, which previously had been returned to FRA unclaimed. The TIRL bridge is unsafe for the movement of trains, locomotives and other rolling stock. The bridge must not be operated over until it is repaired. The letter noted Mr. Sanoian's verbal assurances that he had obtained the services of a contractor to repair the bridge and that he would provide FRA with an opportunity to inspect the bridge once the repairs were made. He also agreed to repair the locomotive before using it again. The letter further stated that unless the TIRL took immediate steps to repair the bridge, Regional Administrator McKeon would recommend issuance of an Emergency Order prohibiting its use. January 18, 1996: During a telephone conference with Regional Administrator McKeon and Deputy Regional Administrator Lawrence Hasvold, Mr. Sanoian requested permission to use the locomotive to move material to repair the bridge. Regional Administrator McKeon advised Mr. Sanoian that the locomotive could not be used until it was in compliance with the applicable Federal regulations. January 19-22, 1996: The TIRL received loaded boxcar RBOX 40945 in interchange from Conrail, moved it across the bridge, and placed it at the consignee's facility on Tonawanda Island. This move presumably was made with the railroad's only locomotive. January 25, 1996: Principal Inspector Lutz again inspected the TIRL locomotive and issued inspection report No. 1, informing Mr. Sanoian of 14 items not in compliance with Federal railroad safety standards. As a result of the inspection, Inspector Lutz removed the TIRL locomotive from service by issuing a Special Notice for Repairs, Form FRA 6180 (``Form 8''). A copy of the form was placed in the locomotive cab. January 29, 1996: FRA Inspector Ron Marx conducted a track inspection on the TIRL and identified five deficiencies, including a five-and-one-sixteenth-inch cross level deviation on Bridge 7708810. This serious track defect does not meet even the minimum track geometry standards contained in 49 CFR Part 213. In addition, the added load placed on one rail by a downward tilt of the track to the downstream side further overloads the already severely degraded bridge structural members supporting the bridge timbers to which that rail is attached. Inspector Marx also found combustible debris located against the southeast corner of the bridge. January 29-31, 1996: Representatives of Parsons Brinckerhoff, Quade and Douglas, Inc. inspected Bridge 7708810. Parsons Brinckerhoff, an engineering consulting firm with nationally recognized expertise in bridges, including wooden structures, is under contract to DOT to inspect Bridge 7708810 and to advise FRA of the bridge's structural condition. Parsons Brinckerhoff evaluated the bridge in accordance with accepted principles of structural engineering as contained in the ``Manual for Railway Engineering'' published by the American Railway Engineering Association. Parsons Brinckerhoff determined, and reported to FRA, that the bridge is unsafe, even for the movement of TIRL's 50- ton locomotive. The investigation performed by Parsons Brinckerhoff on behalf of FRA disclosed that bridge 7708810 is in need of repair and should be closed to all rail traffic until adequate repairs have been made. A report of the investigation notes that severe deterioration and distress exist in the three northern stringers of the westernmost span of the bridge structure. The damage includes severe section loss caused by fungal attack, crushing of the bearing surfaces due to an inadequate bearing area, and horizontal shear cracks along most of the length of the stringers. The three stringers are so badly deteriorated that they are considered as failed. Because of the complete lack of support under one rail, the entire span is rated zero for live load capacity. Failure of the bridge under load could have very serious consequences. In addition to killing or injuring railroad crew members, failure of the bridge also could kill or injure pleasure boaters on the river or at the marina. A catastrophic failure of the bridge causing any pollution of the Niagara River, whether from locomotive diesel fuel or from the contents of a boxcar, could have international impact. Furthermore, failure of the railroad bridge over the fast-moving current could damage the nearby highway bridge. The results of bridge engineers' inspection of Bridge 7708810 have led FRA to conclude that any future use of the bridge poses an imminent and unacceptable threat to public safety. A past pattern of failure by the TIRL to comply with Federal railroad safety laws and regulations persuades FRA that reliance upon the cooperation of the TIRL to repair the bridge to safe condition is inadequate to protect public safety. I find that the unsafe conditions discussed above create an emergency situation involving a hazard of death or injury to persons. Accordingly, pursuant to the authority of 49 U.S.C. Sec. 20104, delegated to me by the Secretary of Transportation (49 CFR Sec. 1.49) it is ordered that the Tonawanda Island Railroad shall discontinue, and shall not permit, the operation of trains or any railroad on-track equipment over Bridge 7708810 while this Emergency Order remains in effect. The Tonawanda Island Railroad may obtain relief from this Emergency Order by providing the Federal Railroad Administrator with a report of inspection and evaluation of repairs, indicating to FRA's satisfaction that the Bridge 7708810 has been acceptably repaired. The report should be prepared by an engineer who is technically proficient and legally competent in the field of railroad bridge engineering, and it should state that the capacity of the bridge to carry safely railroad cars and locomotives has been restored. The configuration and weights of the loads for which the determination has been made should be stated in the report. Upon FRA's approval of the bridge engineer's assessment of the bridge restoration, and following an inspection by FRA if the agency deems it necessary, the Administrator will rescind this Emergency Order. Any violation of this order shall subject the person committing the violation to a civil penalty of up to $20,000. 49 U.S.C. Sec. 21301. FRA may, through the Attorney General, also seek injunctive relief to enforce this order. 49 U.S.C. Sec. 20112. This Emergency Order shall take effect at 12:01 a.m. (EST) on February 13, 1996, and apply to all operations of trains or railroad on-track equipment on Bridge 7708810 on or after that time. Notice of this Emergency Order will be provided by publishing it in the Federal Register. Copies of this Emergency Order will be sent by mail or facsimile prior to publication to Mr. Corigan Sanoian of the Tonawanda Island Railroad, the Consolidated Rail Corporation, International Filler Corporation, the City of North Tonawanda, New York Department of Transportation, and the Association of American Railroads. Opportunity for formal review of this Emergency Order will be provided in accordance with 49 U.S.C. Sec. 20104(b) and section 554 of Title 5 of the United States Code. Administrative procedures governing such review are found at 49 CFR part 211. See 49 CFR Secs. 211.47, 211.71, 211.73, 211.75, and 211.77. Issued in Washington, D.C. on February 12, 1996. The line is former Conrail trackage acquired in 1983. 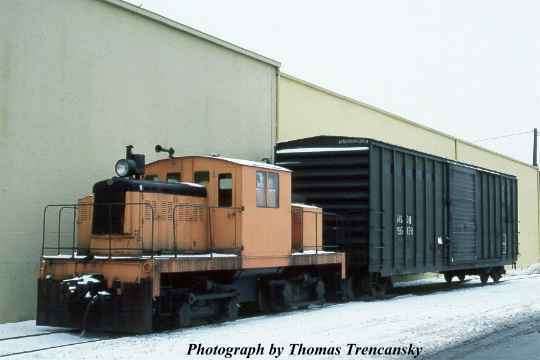 Tonawanda Island Railroad began operation on February 14, 1983. It was acquired by the L&H Railroad Company (Cory Sanoin) in 1988.